“Starts August 2011” A Tisket, A Tasket Quilt Kit from Windham Fabrics. A Tisket, A Tasket designed by Ann M. Wanke. 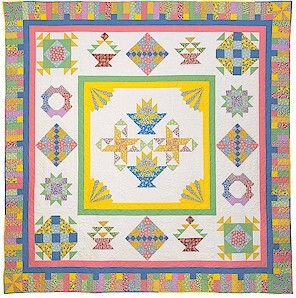 This vintage style quilt features quilt blocks reminiscent of the 30’s era. Fabric featured is Floursack Collection by Whistler Studios. They replicate charm of years gone by. Each month you will be constructing two to four blocks. “A Tisket, A Tasket” block of the month includes patterns and fabrics for quilt blocks, settings, borders and binding. In addition, you will receive several bonus patterns for using up leftover fabrics. FABRIC FOR BACKING IS SOLD SEPARATELY. Note: If you choose to use a fabric 44-45″ from the Windham Floursack Collection 10 yards is needed for backing. Please list fabric item # selection in COMMENT SECTION. This entry was posted on Wednesday, May 11th, 2011 at 3:54 pm and is filed under Uncategorized. You can follow any responses to this entry through the RSS 2.0 feed. You can leave a response, or trackback from your own site.